If you are looking for a wedding invitation that will truly captivate everyone, then we have just the thing for you. It is handmade, and printed on a heritage press. If your wedding is around the corner, and you have yet to figure out a wedding card that will be simple, elegant and different, head to Kolkata’s old idolmakers colony, Kumartuli. In the narrow lanes, inside an unassuming, shed-like building with no signage sits Biswanath Bag. The locals know him as 'Bishuda'. 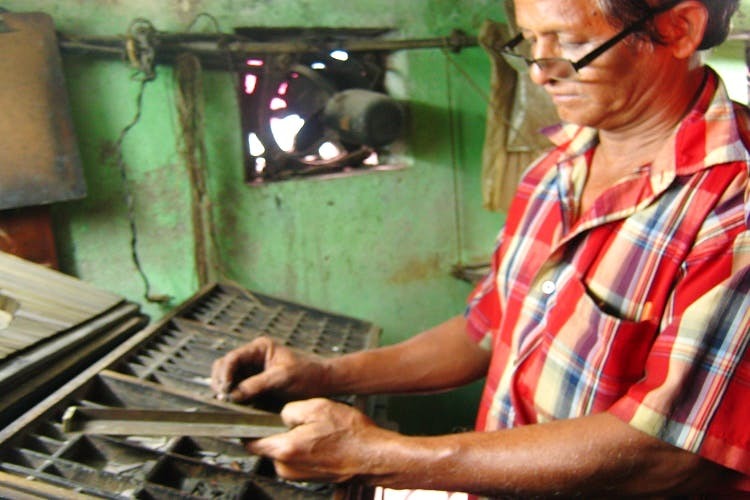 He owns two old letterpress machines and many shelves and boxes brimming over with metal type - numbers, and alphabets in English, Hindi and Bengali. If you choose him, you will be getting your card printed from one of the few remaining old letterpress operators in the country. Letterpress dates back to Johannes Gutenberg and Bag is one of the few surviving members of this age-old tradition. Some of Kolkata’s oldest sweet shops still get him to design their logos fro those white cardboard boxes they give the mishti /mithai in. He has even worked on a book on Gutenberg and his revolutionary printing process for an Australian customer. He charges around INR 400 for an A4 page of type. But then who can put a price on beauty and? Make sure you have some time in hand as setting the type and printing may take a few days. Try not to bargain as this requires skill and it takes time to do the work.